Quaint Hacienda-Style Luxury Hotel with Superb Service. Turn back the clock and enjoy this hidden gem from the Colonial era. Casa Turire is a former hacienda, turned into a quaint and charming luxury hotel. It is located just two hours from San José in the agricultural heartland of Turrialba, and it stands out as an ideal choice for couples looking for an intimate getaway of serenity set in a picturesque countryside. Casa Turire has a working farm on site, is surrounded by colorful gardens, and has an impressive view of Lake Angostura and Turrialba Volcano. 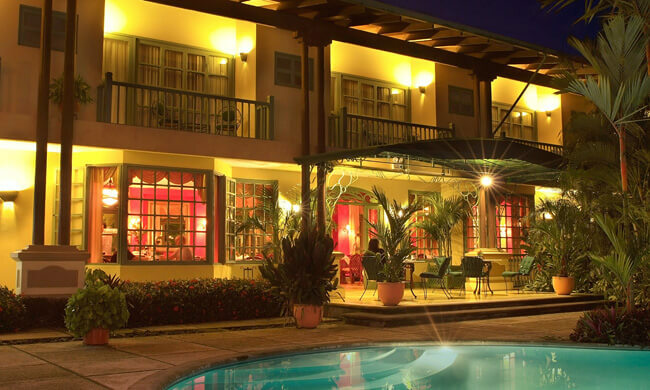 The hotel has 16 rooms, each with a balcony to enjoy the lush gardens, and all with comfortably quaint furnishings. All rooms have a private bathroom with hot water, satellite TV, ceiling fans, hair dryer, safe, and phone line. Only the suites have A/C, Jacuzzis, and a sitting area. Hotel amenities include complimentary WiFi throughout the rooms, reception, restaurant, and pool area (not the gardens). The full-service restaurant serves breakfast, lunch, and dinner with traditional Costa Rican cuisine. You can enjoy your meals outside with a view of the pool, or dine indoors. Freshly brewed Costa Rican coffee, available from the early morning, is a perfect treat to enjoy in the comfort of your room or immersed in the garden’s gazebo. On-site offerings include a pool, lush gardens with hiking trails, and a working coffee plantation. The on-site spa offers facials, massages, and body wraps (using local volcanic rock and chocolate). Foosball and pool tables are available, as well. The hotel is committed to environmental protection, having become certified through the Costa Rican Tourism Board with a Level 4 CST (Certificate of Sustainable Tourism). If you’re more of an adventurous spirit, go white water rafting, canoyoneering, or mountain biking. There are several options in the area to choose from.